Poland: Śląski a strong candidate for white elephant? Stadion Śląski will reopen its doors in July 2017, following 7 years (!) of highly criticized upgrades. It’s not a new stadium but a true football legend for Poles, though the long absence entirely changed Poland’s stadium landscape. When it was closing for reconstruction, Poland had no large stadium left. Now there are five arenas able to hold over 40,000 people and they had a head start in contracting events. Will Śląski become a major player with its 54,000 seats? “It will, but not from the start, not instantly. I wish it good luck and hold fingers crossed. But so far, which fills me with anxiety, it’s a strong candidate for a white elephant.”, says Grzegorz Kita, chairman of Sport Marketing Polska. “Śląski is already seen as an odd project, which consumed huge amounts of money and few people understand why it’s taking so long. The venue needs competent, well-paid, in fact top managers to make sense of the project. The potential is great, but making use of it is a different thing. Meanwhile, combining the stadium’s potential with that of nearby Park Śląski could result in fantastic synergy”, Kita claims. So far Śląski has a promising declaration from the Polish FA. While the Polish Cup final and almost all national team games will continue to be played at PGE Narodowy, Śląski was recently suggested as host of the Supercup and up to two internationals a year. This could boost its profile, but there’s a lot to compete for with other stadia/cities. And, perhaps most importantly, there’s the issue of anchor tenants, Ruch Chorzów. While the team is among Poland’s most successful historically, it’s current season is a disgrace. Ruch are 16th out of 16 Ekstraklasa teams and might face relegation. Can Ruch succeed after moving from 10,000-seat Cicha to 54,000-seat Śląski? “It’s a bold idea, but the question is which Ruch will we see in 2017. If it would be the current team, then it’s not looking good at all. […] Expectations and pressure on the club will grow in the large stadium. 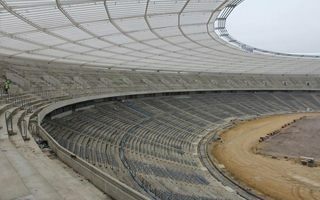 If Ruch’s executives think that sponsors will be lining up just because of the stadium, than they’re wrong.”, Kita says. SMP leader believes the relocation has a chance of succeeding, but also faces numerous challenges.